This ICTA organised session s part of their out-reach and education effort for the industry. Micheal Archer, [above, no longer Doremi but] Dolby does the welcome and introduction. “We started out in special attraction and now we are entering cinema. Cinema traditionally catered to two senses – sight and hearing. We offer two additional, touch and smell (as of yet we don’t do smell).” That’s how Dan starts his presentation. Each speaker is restricted to just five minutes, so each session is no more than 15 minutes. Short and snappy. Dan runs through the company essentials. Pivately owned company. Worked with Disney, Legoland and other theme park partners. 9,488 seats, 122 sites, 30 countries installed based. Cinemex, Cine Colombia, City Cinema in Oman. Apprived and worked with all the Hollywood studios. “So 14% is customers you wouldn’t get at all,” Dan says, reffering to the last two categories put together. MediaMation work with USC to set up a 4D studio with 4 programmers that do nothing but program seats all day (and night). Pitch, roll and heave motions. “We like to do full theatres if you are going to have the full environmental efect,” Dan says, when it comes to cinema installations. Ends with a customer testemonial. “Honestly, we didn’t pay this guy.” Attraction Theatre Review clip plays. He ends by telling the audience that they have recently set up a JV in China “and a factory coming up here to service all of Asia.” Working with alternative content for gaming and more. “In 2000 we started selling the first systems for OEMs and custom installers. Then in 2006 second generation of D-Box system. 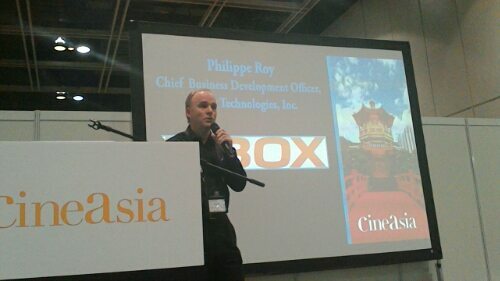 2009 was the first time we did a installation for cinemas in USA,” Philippe says as he runs through the company chronology. D-Box “Increases moviegoer’s loyalty”. And that’s Philippe’s 5 minutes finished. Brandon Says he will be a little less technology and insted focus on Asia and the immersiveness of movies. Second topic is immersiveness. Sound, screen and seat system all offer immersiveness. Offers the example of the CGV cinema where each floor offers a different cinema experience (see photo below). 3 Factors for Absolute Cinema Experience. Realizes – Creates – Listens. 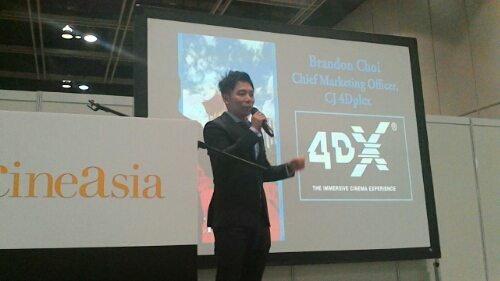 4DX auditoriums box office has been at least 1.5x higher than average Chinese theatre – result of both upcharge and higher attendance. 150 screens in over 30 countries end of this year. China 30 screens with 5 exhibitors. Goal is 120 screens by 2016. Just signed a deal with Wanda. 20 million admissions by end of 2014. 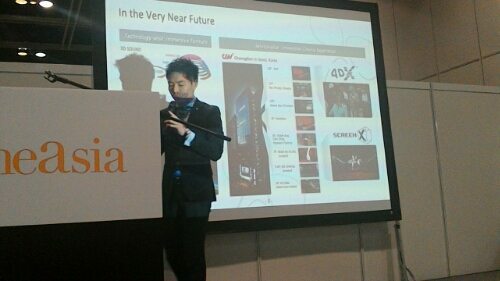 Screen X – “This is similar to the Escape screen of Barco.” Already over 70 such screens in operation in Korea. Loking to expand to the rest of the world. Thank you.